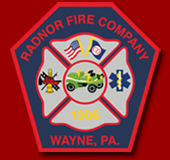 Radnor firefighters had the opportunity to participate in Swedesburg Fire Company's annual fire prevention show this past week in nearby King of Prussia. A crew of Radnor Fire Company firefighters performed a car rescue demo for attendees, demonstrating door and roof removals in a simulation. The Swedesburg Volunteer Fire Company is believed to be the first in Montgomery County to participate in ritual of blessing fire trucks; this practice began in 1942 when the company chaplain invoked God's protection on the vehicles and those who ride them.